Substitute Danny Ward scored a hat-trick to help Huddersfield Town finish the season on a high and end Watford's 10-game unbeaten run at Vicarage Road. Joe Lolley, making his full debut, opened the scoring for the visitors by shooting home just after half-time. Ward's low drive doubled the Terriers' advantage, and the midfielder finished instinctively to make it 3-0. 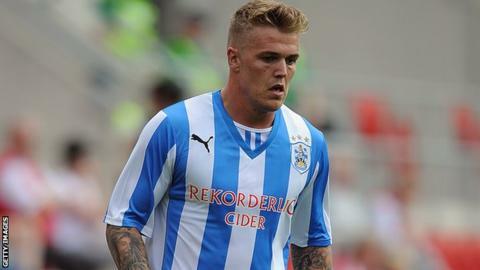 Huddersfield midfielder Danny Ward's first professional hat-trick helped him finish with 10 league goals in a season for the first time in his career. His hat-trick came from a curling free-kick before Troy Deeney netted a late consolation from the penalty spot. Watford came into the game having lost just once at home in 2014, a 1-0 defeat by Reading on 11 January, but they were blown away by the Terriers in the second half. Striker Lolley broke the deadlock almost straight after the interval when he intercepted a pass, twisted and turned his way past Watford's defence before firing home. And he set up the second for Ward, who powered into the box and struck a low drive which squirmed under the body of home goalkeeper Jonathan Bond. Lolley, who joined Huddersfield from non-league Kidderminster Harriers in January, also had a hand in the visitors' third when he knocked the ball into the path of Ward, who finished well. Ward, who had come on in the 30th minute, completed the first hat-trick of his professional career with three minutes remaining when he curled a free-kick between the post and Bond for his 10th goal of the season. The scoring was not finished, though, and Watford netted a consolation in injury time when Deeney converted from the spot after Peter Clarke was penalised for a foul following a corner. Victory meant Huddersfield finished 17th in the table, with Watford four places and seven points higher. Watford boss Beppe Sannino: "I'm here just to put my face in front of everybody because I'm the head coach, the leader of the group. "I'm sorry because we did finish this season in front of our supporters in the worst, worst manner possible. "I don't like to speak about my players because it would be easy to speak when there is a good moment and also when there is a bad moment." Huddersfield boss Mark Robins: "We were excellent from start to finish, I thought we controlled it as well as we could. "Alex (Smithies) made a couple of good saves before we eventually took the lead. The first half was a little bit of a cagey affair but I thought in the second half we were good value for a win. "I didn't see four goals coming from it but Danny Ward's got a hat-trick, I'm absolutely delighted for him, Joe Lolley's got his first goal for us and I thought his debut was outstanding and it was a good game for him to come into and perform." Match ends, Watford 1, Huddersfield Town 4. Second Half ends, Watford 1, Huddersfield Town 4. Goal! Watford 1, Huddersfield Town 4. Troy Deeney (Watford) converts the penalty with a right footed shot to the bottom left corner. Penalty conceded by Peter Clarke (Huddersfield Town) after a foul in the penalty area. Penalty Watford. Troy Deeney draws a foul in the penalty area. Corner, Watford. Conceded by Oliver Norwood. Corner, Watford. Conceded by Peter Clarke. Corner, Huddersfield Town. Conceded by Daniel Pudil. Goal! Watford 0, Huddersfield Town 4. Daniel Ward (Huddersfield Town) from a free kick with a left footed shot to the bottom right corner. Adam Hammill (Huddersfield Town) wins a free kick on the right wing. Foul by Gabriele Angella (Watford). Foul by Sean Scannell (Huddersfield Town). Marco Cassetti (Watford) wins a free kick in the defensive half. Substitution, Huddersfield Town. Peter Clarke replaces Anthony Gerrard. Anthony Gerrard (Huddersfield Town) is shown the yellow card. Gabriele Angella (Watford) is shown the yellow card for a bad foul. Adam Clayton (Huddersfield Town) wins a free kick on the right wing. Adam Clayton (Huddersfield Town) wins a free kick in the attacking half. Substitution, Watford. Josh Doherty replaces Cristian Battocchio. Paul Dixon (Huddersfield Town) wins a free kick in the defensive half. Foul by Marco Cassetti (Watford). Attempt blocked. Troy Deeney (Watford) right footed shot from outside the box is blocked. Attempt saved. Marco Davide Faraoni (Watford) right footed shot from a difficult angle on the right is saved in the bottom left corner. Tom Smith (Huddersfield Town) wins a free kick in the defensive half. Foul by Tommy Hoban (Watford). Jonathan Hogg (Huddersfield Town) is shown the yellow card for a bad foul. Foul by Jonathan Hogg (Huddersfield Town). Samba Diakité (Watford) wins a free kick in the attacking half. Foul by Adam Hammill (Huddersfield Town). Daniel Tözsér (Watford) wins a free kick in the defensive half. Substitution, Huddersfield Town. Sean Scannell replaces Joe Lolley. Joel Lynch (Huddersfield Town) wins a free kick in the defensive half. Foul by Samba Diakité (Watford). Goal! Watford 0, Huddersfield Town 3. Daniel Ward (Huddersfield Town) left footed shot from outside the box to the bottom right corner.